The claustrophobia of a sweaty, packed club. Hop-scotching over vomit and spilled beer. The excruciatingly long lines to both purchase and eliminate beer. I’m sure it was a combination of all of those things that made me look to the heavens and sigh, “I’m too old for this” as I bowed out early on the Pogues “A Parting Glass” show at Terminal 5 on St. Patrick’s night. At first I panicked when I read into the “parting glass” reference as a hint of retirement; the band reformed at the turn of the millennium, and we’ve all become so accustomed to an annual visit from the lads each March that the possibility of the world without touring was a world we wanted no part of. “It does and it doesn’t mean retirement,” guitarist Phil Chevron said during an interview with me a few weeks back. “’A Parting Glass’ was performed for many years. It is ‘A Parting Glass,’ not ‘THE Parting Glass.’ We have been doing it longer than this lineup existed -- 1987-2003. We have been in this lineup since 2001, and this is a moment of pause to see what to do next. I am in no means filing a bad review here; nothing could be further from the truth. The Pogues are legends for good reason. Very few bands are capable of streaming sparks from banjoes, flutes, and accordions the way they can. Every nicked note and nuance of Flogging Molly and Dropkick Murphys can be heard in the band’s read through “Streams of Whiskey,” a cultural tour de force that spun the crowd into a dizzying whirlpool of cheers, fist pumps, and sing-alongs. “If I Should Fall From Grace with God” had a similar reaction. Indeed, you wonder what Randy Jackson, Lopez, and Steven Tyler would make of a singer like Shane MacGowan if he was just starting out now. At 53, he shuffled onstage in a way that hinted at an inability to twist his waist; it was as though his lower vertebrae was fused to his hip. He was dressed entirely in black, including a knit cap and dark sunglasses. The spotlight shone on everyone brightly this evening, yet his was a dark blue hue, creating a Paddy the Cryptkeeper vibe that was simultaneously creepy and captivating. MacGowan might be broken and a shell of his former self, yet he has more charisma in his yellowed and tarred forefinger than the new crop of Idol hopefuls combined. I can report that the singer was swilling liquid all night, but it looked from my vantage point like Poland Spring instead of poitin, though toxicology reports were inconclusive as of this writing. 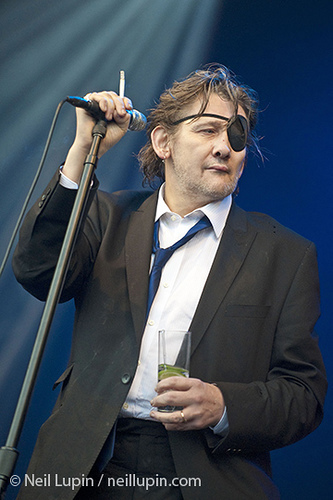 MacGowan’s voice is less of a voice nowadays. The grunts and slurs make his contribution more like an instrument that joins the flutes and fiddles. We’ve grown accustomed on these reunion shows to that beautiful Pogue prose spit out of a rotted mouth that coughs up cemetery dirt every other syllable, but when he sat in a chair and sang “Waltzing Matilda,” the audience heard a voice that was clear and spine-tingling. People debating how the lead singer’s new teeth will impact his singing is an odd conversation, but new choppers in his gob are akin to restringing a lute in an orchestra. While it was a satisfying evening of the old standards delivered by the best in the business, there was a part of me that felt a little awkward and foolish about the concert. It was like spending the night with a college buddy 20 years after graduation, finding little in common while trying to avoid the topic that everyone in the room is middle-aged. I’m 44 with kids and a mortgage in the suburbs, and I am no longer a Hot Topic punk rocker. Some of the Pogues are old enough to be grandfathers, no longer new and dangerous themselves. Maybe Phil Chevron is right. It might be time to swallow the contents in this parting glass and raise a toast for something new between us when and if we ever meet again.